South Florida, well it's Weird. You have Ball Pythons in the Everglades acting like giant vacuum cleaners eating the native wildlife. You have exotic Parrots flying in great noisy flocks that are the multi-great grandchildren of your Aunt Bertha's beloved pet that got released when she moved into The Home. You have up to six foot Iguanas that will turn your hedges into salads. At least this creature belongs here. Sitting in traffic here is better than it is in some other cities. Philadelphia, Atlanta, and New York all have traffic that makes what we have here a "day at the beach". It is Fort Lauderdale, after all. The locals don't take the interstates. We have our own routes to go from point A to point B. We also tell you that but we won't tell you which ones to take. I've been here since 2006 so I'm a local, now. Federal Highway is our section of US 1. It goes from Key West, FL, to Fort Kent, Maine. I've traveled on many sections of it, and I will say that from West Palm Beach to Key West, it's almost always backed up. Goods may come by truck on I 95, but they have to get off somewhere, and they'll almost always touch US 1 at some point. But if you have to get somewhere just off of that beast of a road, you'll find yourself sitting at a traffic light watching the goings on. That lady in the next car putting on lipstick. The kid texting and forgetting that TXT = RIP. The old guy smoking a cigar and picking his nose. Far too many exotic cars for words. Those were the thoughts going through our minds when the frog started looking down inside the car. Here we were, sitting in the middle lane heading south on US 1. The frog had landed on the East side of the car so that means it had worked its way over five lanes to where our car sat. Yes, we were playing Frogger, In Real Life. It was one of my favorite Back In The Day games in the 8 Bit Era, anyway. We could call it Kermit and ask "Hey you wanna little help?"! 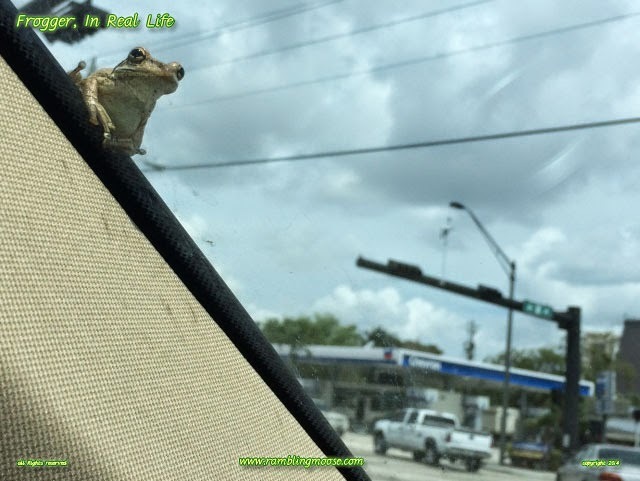 The frog jumped onto the roof of the car. The frog then got onto the car next to us, then onto the tree near the road. Doing our part, folks! Just doing our part.